to offer 4-day master classes and one-on-one distance learning in 4 topics of study. Each topic of study stands on its own and can be done separately or in any order as you prefer. ♦ Studies advanced, complete and conveyed in one single gathering – no modules. ♦ Your one-on-one training is divided into 2 phases – totaling 18 weeks. 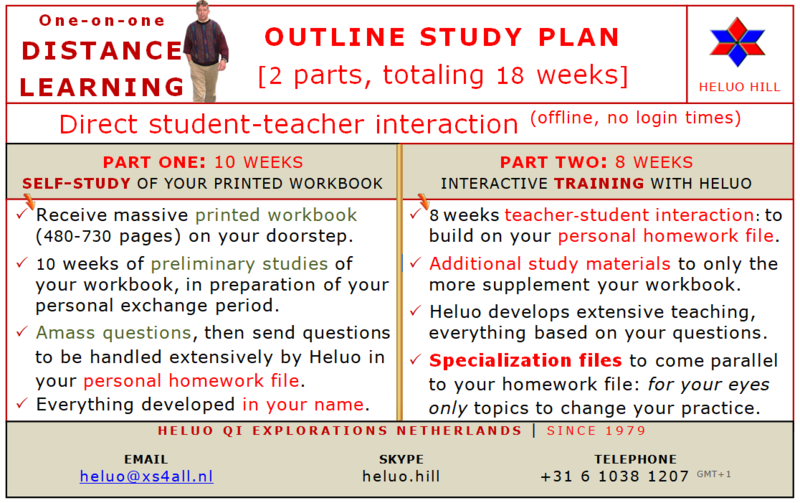 ♦ 10 weeks of self-study, followed by 8 weeks of intensive teacher-student interaction. ♦ Everything offline, no login times, questions-answers based, everything written on your person. hand of 9 Stars and Luoshu, for any time past-present-future. Nothing beats it! Becomes detailed: indispensable to yourself and as you support others professionally. 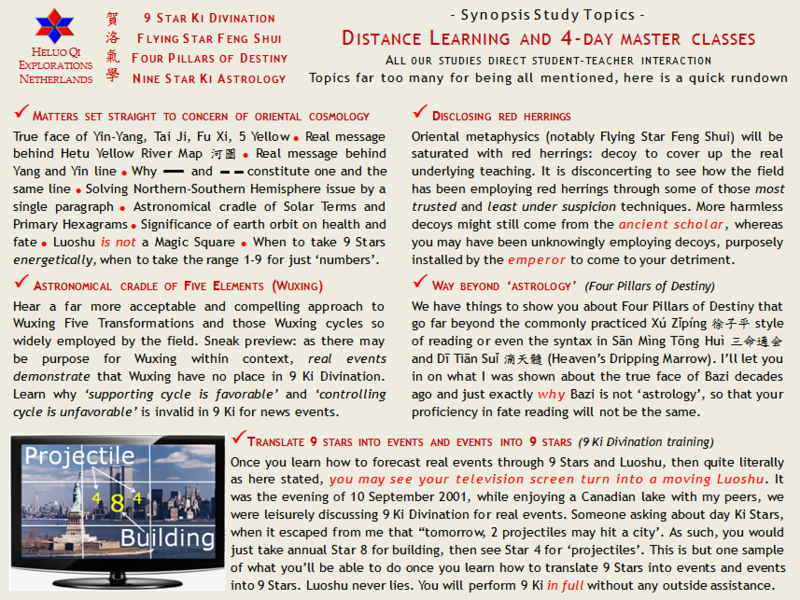 our restricted 9 Ki Divination forum, where you’ll meet fellow students). highly competitive insights, which make for a lasting impact on how you read a Bazi birth chart. The hidden agenda of your house. Hear the true meaning of ‘Mountain and Water’. How (not) to employ annual- and monthly Stars for purpose of house divination. those 1980s standards. 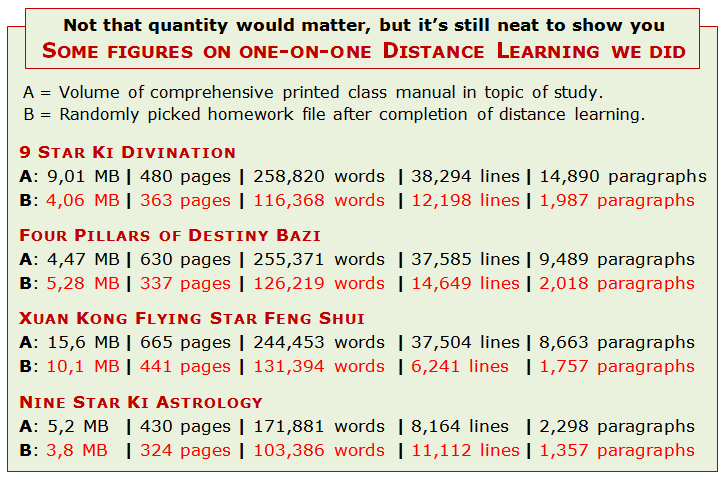 Insights into Kanagi Guruma, formula to calculate day Ki Stars. Once done reading this page, you may go and see Class Topics further explained. This is your full fledged private training – study period reserved in your name – where you’ll get to meet the ancient scholars as you step into direct student-teacher interaction and meaningful learning. Study in your own time and wherever you are! No distance learning path with us ever the same: this intensive study format revolves around your personal questions, while our distance learning does not require that you are online at any time. Unlimited access to the training materials (no ‘login’ or just a limited period of time, but after which you could no longer access the study materials). Following 10 weeks of preliminary studies of the printed workbook in topic of study (delivered on your doorstep), we engage in 2 months of effective student-teacher interaction on the basis of your ever growing homework file. Receive additional manual (email), to only the more supplement the book that you had received. As a bonus: this book will let you take advantage of question-answers done for previous studies. This workbook will function as your personal homework file, where Heluo will handle your questions and whatever you bring up for discussion extensively, everything written on your person. Your personal homework file will pass between us twice, so that there’s ample opportunity for you to pose new questions in between homework files. We’ll throw in supplementary ‘for your eyes only’ private student materials for your proficiency. Besides comprehensive ‘on topic’ materials, we will add chapters more, so as to ensure profound overall command over metaphysics, cosmology, diet, Wuxing, Japanese face diagnosis. You’ll receive 2 specialization files to come parallel to your personal homework file, with assignments on expressly advanced topics. These specialization files alone will ‘justify’ your participation, as we’re changing what perception you had on metaphysics, to really build on your professional practice. Studies comprehensive and customized to meet your training needs. Each distance learning training earns a Certificate of Completion, no tests. Our carefully thought out study plan never requires that you return to class for successive modules, only so that you would endlessly collect the curriculum in any single topic of study bit by bit. A competent teacher will work from the departure point that you are entitled to advanced knowledge immediately at the start of his training. We never distinguish between ‘beginner-intermediate-advanced’. Prior knowledge is not really a requirement, but if you had gone through ongoing training – perhaps even your professional practice in full swing -, you will be overjoyed now that you came on this training. Your practice will not be the same. Usually, as your training comes to completion – or at any time earlier as so desired -, we will meet one-on-one in Skype, which is optional, but our opportunity the more to meet ‘real time’ and to yet exchange on topics more directly and to handle more refinements for your practice. As we can be only yet taking advantage of a setting where just we are among ourselves, you may note the difference between personal and personalized. Vis à vis: that’s plain English for saying ‘face-to-face’. We will be at no real distance here, as we will proceed exactly as just had we gathered around a table. You will learn unrestrained, fully enjoying ‘momentum’ in true learning, where we may not evade to discuss touchy subjects either. I can be minding teaching only. Besides our 4-day master classes in our permanent classroom in the Netherlands, I devote to teaching distance learning the entire day, which is also why I haven’t been doing lectures, workshops or introductory courses. You want to learn Oriental metaphysics as it was intended by the ancient scholars, who had been astronomers, mathematicians and physicists. Not only can we do without myth, folklore, ‘anything goes’ or ‘anyone’s guess’, there are no secrets. In fact, we have a saying in the Netherlands that pretty much defines our blood ‘n’ bones: “If just you acted normal, that will be strange enough..”, as also, the Dutch wouldn’t be applauding for air. Have you ever stumbled upon confusing matters or over contradictory teachings? Have you been sitting with unfinished class notes, questions earlier not attended? Tell me, we’ll handle the matter. Then, if you can’t travel to meet me in class face to face, this is the right platform for you, as we are used to taking on controversial subjects in the field all the time, not dodging inflammable topics such as those red herrings (smoke screens) so widely employed ‘out there’. Know that, besides ensuring that you’ll be well trained and highly competitive in ‘conventional materials’, our training is to distinctly and explicitly side-step by letting you process materials otherwise not available anywhere else. It is essential for us to know that, as our student, you’ll be able to take on any – if need be taxing – debate with no matter which acclaimed master in the field. This is to ensure your autonomy, competitiveness and to help set you apart from others in the field. Just drop me an email with your queries, or propose a good time for us to meet in Skype for a brief voice call (GMT+1), so that we’ll have a chance to exchange much more directly. As if quantity matters, but I like to first mention MB, number of pages, words, lines and paragraphs of our class manuals, then values on some randomly picked completed training paths (personal homework files) that we were able to do for our individual students.